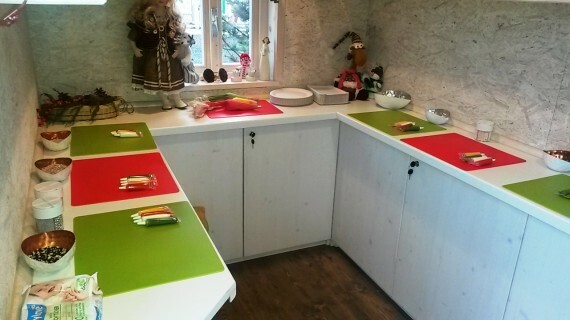 This new educational attraction opened on 19.12.2014 So it is a brand spanking new Indoor and Outdoor activity for families with Kids. It is a bit confusing for foreigners so I will do my best to explain how it works. It is a great concept but if you blindly end up here, you will be confused and disappointed. Sure, they do have signs in English, but the staff doesn’t speak English except one Lady-manager, who is not always available. We also organised a birthday party for my Son here, but that is coming in a separate article. Get ready, that your Kids will outsmart you!! 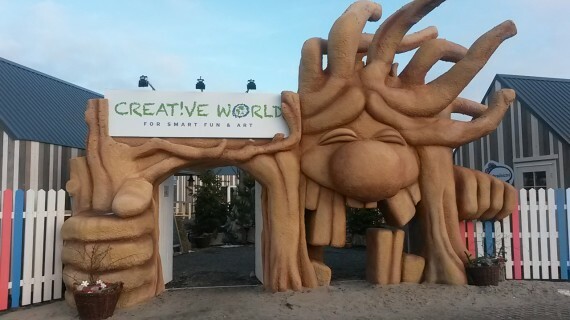 The Creative World has two sections. 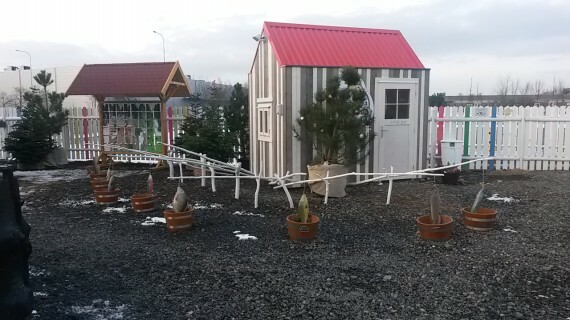 2) The Outdoor Area - with several huts with different activities. They call it a Fairy Tale trail. For the price of 129czk the child guides themselves through they are given a card with a map and instructions. 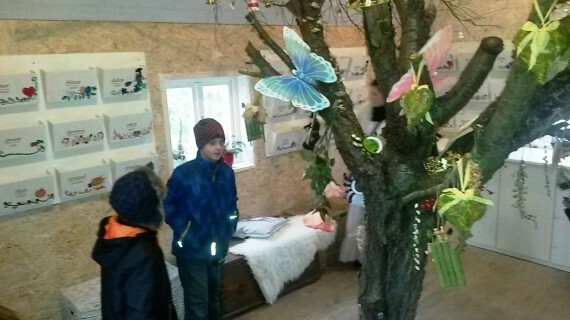 (available in English as well) You visit each hut one-by-one and complete different educational tasks. For every hut completed the child gets a stamp. When a child collects 4 stamps, they can pick a souvenir gift (a thimble filled with honey) which they keep, this is inside the Farm hut. I will explain each hut separately and the activities you perform in them but first, let me explain the treasure hunts. The Kids can seek treasures in 4 different huts. This is paid separately on the spot. 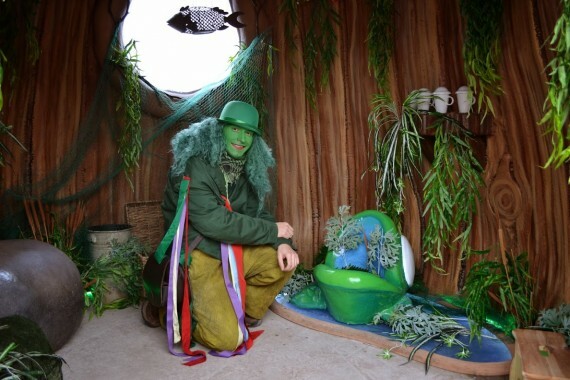 Every hut has an entertainer who looks after the small visitors and you can purchase the treasure hunt through them. The treasure hunts costs 49-69 crowns and you can buy one or all of them. Kids love this and get ready, they will want them all. 2) Waterman’s Hut - now, this is something that comes from Czech tradition. I will try to explain this to our international readers, but… oh well. No matter how I dress this up - it will sound weird. So here we go. Czech fairy tales say, that the Waterman (Vodnik) lives in ponds. And he drowns people. He keeps the souls of all the people he drowns in tea-cups with lids (so they don’t escape). The richest Watermen have a cellar full of shelves with such cups. OMG, I am really sweating here. Pls. keep in mind, the majority of fairy tales are really cruel in the core. 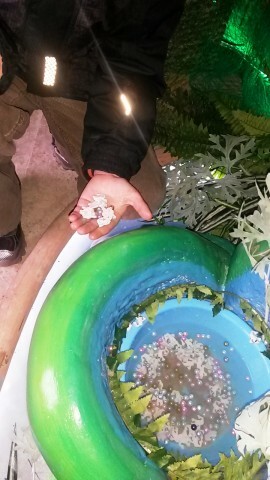 So here, in Watermans hut, there is a little well, where Kids fist for small beads in the shape of ghost (souls). So they literary have to sink their hand into the water to fish the souls out. Kids keep the cup with the lid and the content. 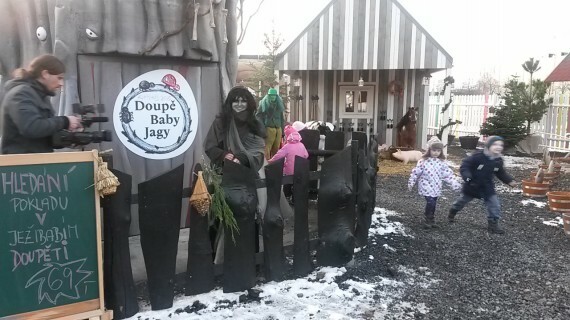 3) Baba Jaga (Witch) hut The entertainer is dressed up as witch. Some kids could be scared of her. Her hut has dimmed lighting with lots of spiders and skeletons hanging around and other scary stuff. 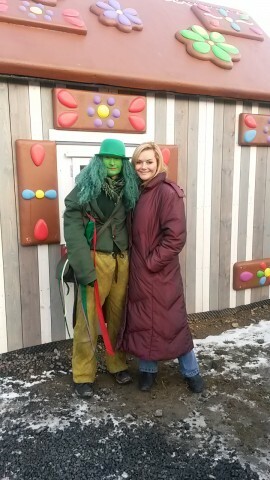 She is very friendly, but some kids could freak out, especially, when she closes the door. She has a pot full of hairy creatures (toys) and kids have to look for plastic diamonds with their hands in between the creatures. I tried and it seems real :-) for finding the diamonds they get a treasure chest, they fill it up and keep it. 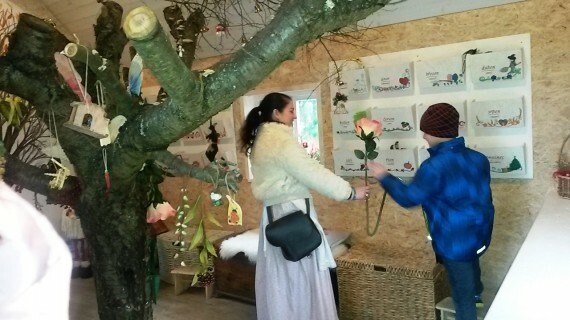 4) Traditions in Czech Calender Hut - Here, the child can purchase a key to a special locker, representing one month of the year. Every locker has items representing the given month. For example: in December - the child will get a Christmas bell decoration. Now back to the hut stations. 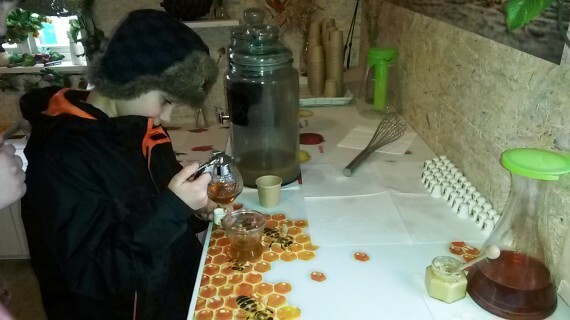 The kids can start anywhere, yet - in the Farmers Hut they get the thimble filled with honey for completing the trail. Wherever the children start, they should finish back at the Farmer’s hut to get their reward. The whole trail focuses on education the children. Using their touch, smell and…. brain. I must admit I was lost few times, telling my children - oh well, you should really know the answer to this one :-D Every hut has a guessing system of flowers, plants, herb etc. 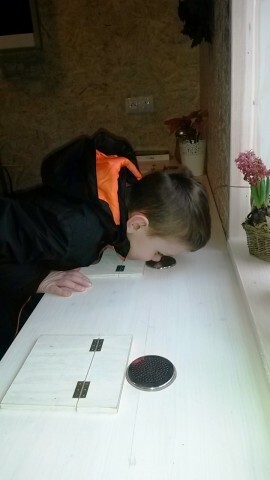 2) Gardening - here children use their touch sense, by reaching into blinded holes, guessing what is inside the boxes (chestnuts, cinnamon sticks..) and also, they smell small openings with seasonings, guessing which one is which. All of them have an un-foldable hint. 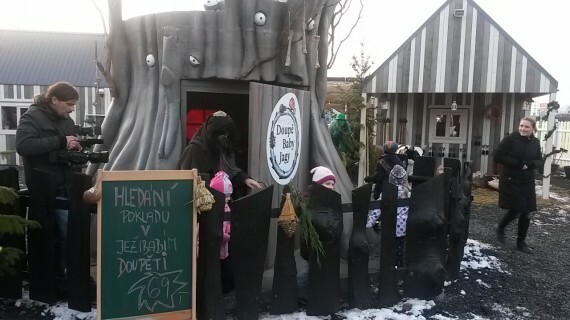 3) Traditions of the Czech Calender - in the middle of this hut, there is a big tree with different objects hanging on it. Children place objects in special shelves - according to which month of the year they belong to. 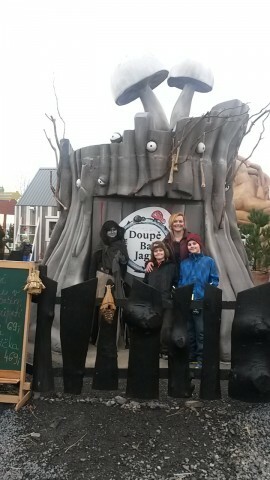 My boys enjoyed it very much. 4) Meet Our Animals - again, you might find it a bit cruel. Here they have a cow and a pig on the wall as a puzzle, and children learn different meat cuts of the animals we consume to complete a puzzle. This hut was the least attractive one for my kids. Im not so sure they were interested in tenderloin etc. Yet I guess it’s educational. 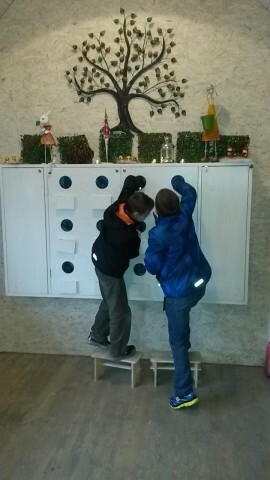 5) Hansel and Gretel - here you can purchase Ginger bread and decorate it and the kids keep the results. 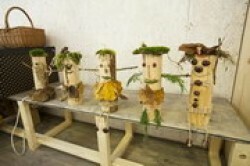 6) Creative Bower - here the Kids can build their own mascot from forest materials. In Czech it is called: “Otesanek” which is a figure from a Czech fairy tale. 8) The Witches hut - a treasure hunt, the witch wonders around all the time. She is very kind, but kids have respect for her. What I almost forgot to say is - the whole concept is very Bio/Organic. They do serve proper meals, but you have to purchase it outside in the food trail and you can take it inside with you. They grill fish, cook fresh healthy soups etc. It tasted really nice - but took ages. The whole service here is a bit slow - but hey. They have just opened. So yes - you can have a proper lunch here - and for example the onion soup was very good. 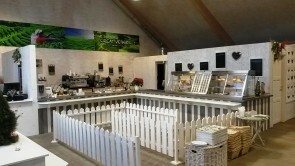 Also inside the main Cafe - they serve organic Tea, sell farmers milk and cheese and cosmetics with natural ingredients. The indoor play area has many toys. It is not separated from the cafe and the kids just run around freely and play with the toys. I am just wondering how long the toys will last. Don’t get me wrong - I don’t mean to accuse anybody. But I can see children smuggling the small toys into their pockets just like that. 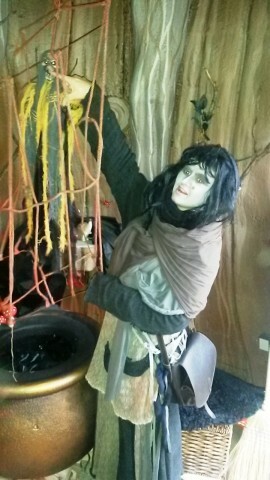 I really liked that the Fairy entertainer within the main Cafe area, she doesn’t just sit on her chair in her little pretty corner, but engages with the children, playing and looking after them. I do wish them well. It isn’t a classical Indoor or Outdoor playground, but it is a very nice place where you can easily spend a half of the day. When we hosted the Birthday party, the animators took the Kids of four hands and guided them through the huts meanwhile we had an adult talk and a coffee. How convenient. We hosted my Son’s birthday party here. The kids loved it, but they do not have packages just yet. I will cover this in another article. You just tell them what kind of refreshments you want and in which price and they organize the whole thing. The Kids do the trail with an entertainer. We asked for canapees 2x per person, veggie platter and a fruit salad. The Birthday decoration you pay extra for. We have ordered a cake with them and it was wonderful. It was a Minion carrot/bannana cake on demand. It costed us 2000czk but it was very tasty and it was a huge success. I just sent them downloaded image from Google and they made it just perfect.